PREVIOUSLY REJECTED FOR DENTAL IMPLANTS DUE TO INSUFFICIENT BONE? NEW DENTAL TECHNIQUES PROVIDE A SOLUTION. 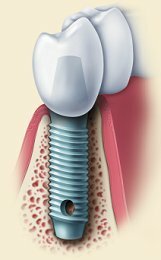 I recently published an online article about revolutionary changes that allow placement of dental implants in situations when, in the past, such placement would not have been possible. Check out our new article at http://worldental.org/teeth/previously-rejected-dental-implants-due-insufficient-bone-dental-techniques-provide-solution/10738/.If you are considering dental implants but have been told you are not a candidate because you do not have sufficient bone, contact us for a consult.